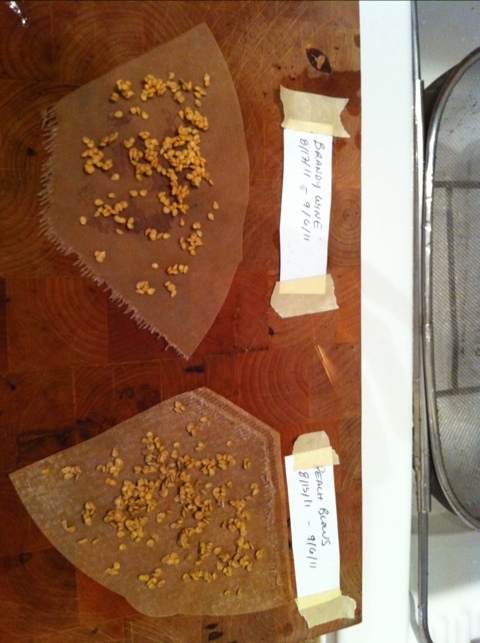 Since I’m working with several different varieties, I decided to use coffee filters cut in half to keep them separate. I’m also being very careful to wash and dry my hands and tools (fine sieve and spoon) between each cleaning so that a Peach Blossom doesn’t get mistaken for a Brandywine. I have to admit there are a couple unlabeled jars that in my haste I didn’t get to — those will be reserved for next year’s mystery garden.